I’m a little late getting this posted. 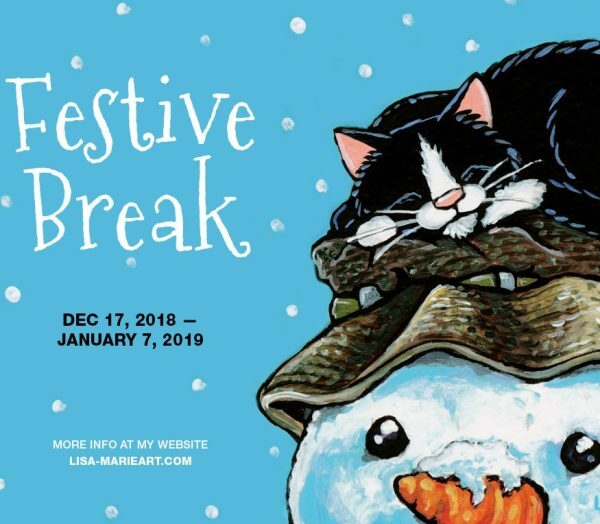 Things have been a little hectic with the run up to Christmas, but I’ve finally found a few moments in between Christmas shopping, posting orders, and making new art, to let you know about the new set of cute cat illustrations that are at Whitby Galleries this month. A little bit of a mixed bag this month. 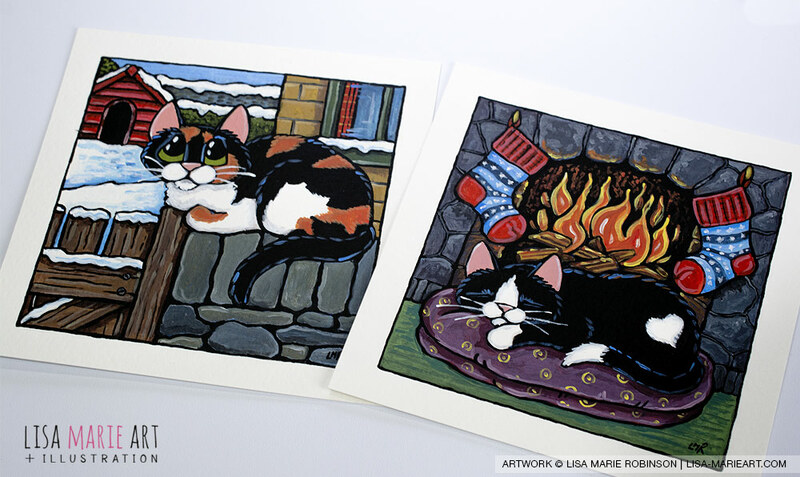 There’s some of the usually homely stuff and a few kitties enjoying the cold winter months. 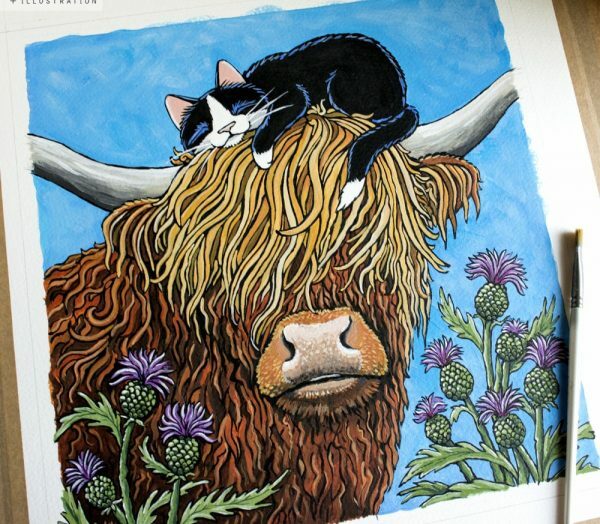 I’ve also been trying out a few new subject ideas and cat colours. My first new theme is cacti. 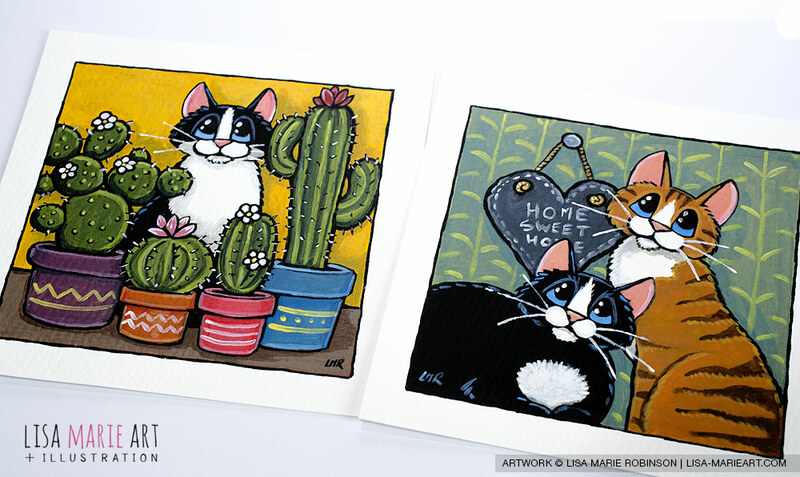 I’ve painted a few small ACEO art cards featuring cats and cacti so I thought I’d give a larger one a whirl. One of the new cat colours I’m trying is an odd-eyed white kitty. I’ve fallen in love with this colour purely because of the different coloured eyes. I’m also trying to incorporate more patterns in to my paintings. 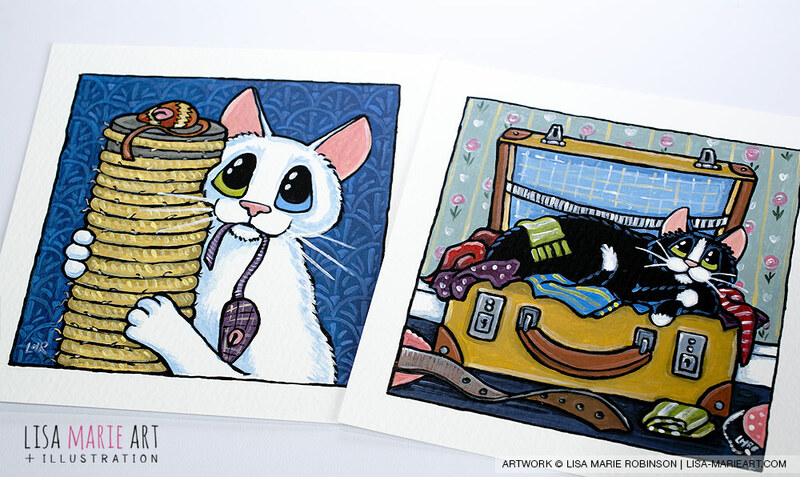 I love the blue Art Deco inspired one I used as the background to the white kitty with her scratch post and toy moice. Definitely going to be using more patterns when I can! We all know I love my tuxedo kitties. As you can see there are more than a few in this new set. 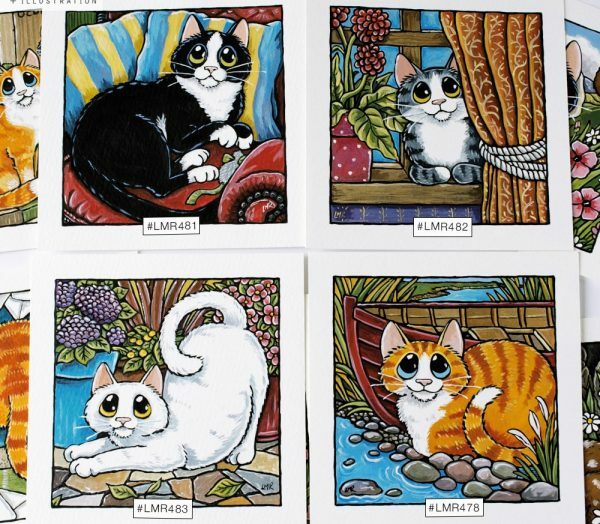 As well as trying new cat colours, I’m also giving more love to the tabbies & calicos. Ssh! 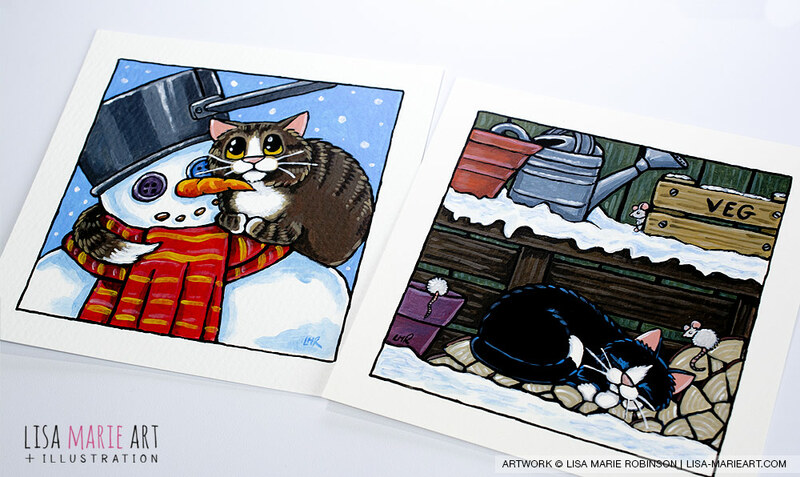 Don’t tell anyone, but I wanted to keep the saucepan hat snowman and tabby for myself. WHERE AND WHEN CAN I BUY THESE? 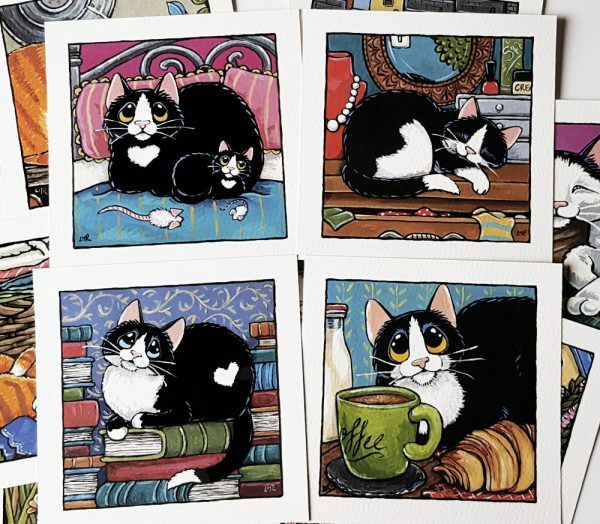 These 8 new cute cat illustrations are available to by from Whitby Galleries right now, located at 134-135 Church Street in Whitby, or if you’re unable to visit in person orders can be taken by phone or email and home delivery can be arranged. As always, please contact the galleries directly with any enquiries about these paintings. Each one is fully framed and the artwork itself measures approximately 5″ x 5″. Massive thank you once again to everyone who has purchased my kitty paintings from Whitby Galleries! The 2017 Cat Calendar has landed!